King Midas wish was for everything he touched to turn to gold. Unfortunately for him the wish was granted. King Midas only realised his mistake when he discovered that literally everything he touched, including his food and drink, turned to gold! Named after the beautiful, golden colour of the final brew, Midas is a rich yet light beer ideally suited to the lager or light bitter drinkers palate. The beer however has a depth and strength which is more akin to that of a traditional English style bitter. The result is a refreshingly light, golden ale which delivers a crisp hoppy taste without any heavy or persistent aftertaste. 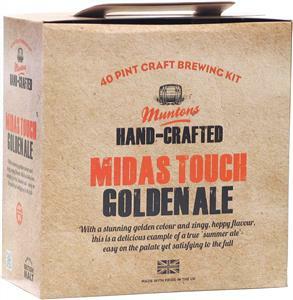 Midas Touch Golden Ale is surely liquid gold fit for a king.